Your Next Stamp Challenge #23~Bold, Bright, Summery Colors! Hello! It's my turn to host our Your Next Stamp Challenge and this time I have chosen Bold, Bright Summery Colors! This is the last week of summer for my kiddos, so I thought this challenge would be perfect:) I used this super adorable image called Flower Bouquet Fhiona and paired her with some fun dp and sticker elements from Echo Park Paper Co. Sweet Summertime. I added a little sentiment from the SU set Teeny Tiny Wishes. 2. Top Pick – one lucky entry, chosen by Karen, will win $5 in YNS Stamp Bucks (to spend on YNS stamps) and the Top Pick Blinkie to proudly display on their blog! [You must use a YNS stamp on your creation to be eligible to win the Top Pick prize]. Thank you so much for stopping by, and I look forward to seeing your bold, bright, summery creations!!! AWWWWWWW Kerri this is soooo sweet!!!! I LOVE your layout for this cutie...oh my word did you ever rock this challenge...SWEEETNESSSS!!! Awww, she's adorable. I love the scallops at the bottom and the flowers with buttons!!! Love that grass punch too!!! Good for you to be hostess! Great challenge, too. I'm proud of you, honey. Your card is awesome! This is so adorable Kerri! Love the colors and those stickers are a really fun touch! Thanks for the fab challenge! How sweet Kerri, Love this card. So gorgeous Kerri! Love her hair coloring! I will miss working with you but you bet I'll still be visiting your blog for awesome inspirations! What a beautiful card Kerri,I love the image and the colours. So, what did you think of Gia's and Nikki's moves? I think Gia should of saved Craig from the get go. Aww, too cute and sweet!! Love the pretty papers and your coloring too! Could she be any cuter?? So adorable. Your Echo Park paper is the perfect compliment for her. I'm glad to see someone uses the grass punch...that's one that is sort of out of sight, out of mind for me. This little girl all colored just right with her get well bouquet is just adorable! Kerri your card is lovley, the bright colours are a perfect choice for your summery card!! Adorable! Love the summer colors of this card! 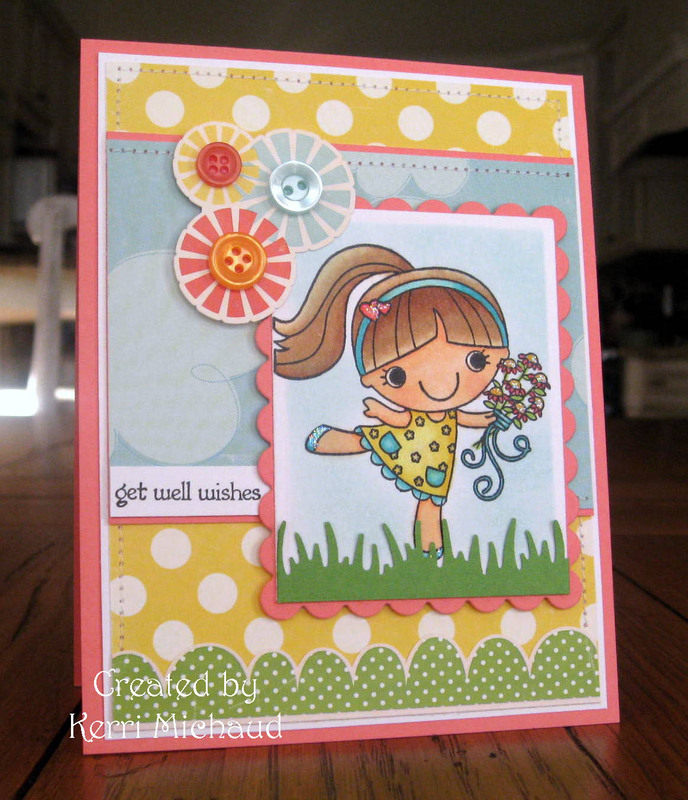 So cute and cheery, I like your button centers on the flowers too.